Editor’s Note: This is the fourth of five “things we learned” from our 4-year study to investigate the fate of rainbow trout and Apache trout stocked into several of Arizona’s popular stream trout fisheries. 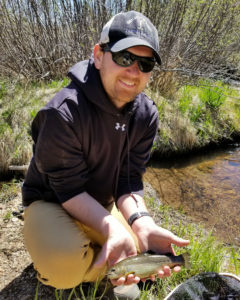 As part of this project, AZGFD biologists conducted nearly 5,000 angler interviews on six different streams (Canyon Creek, East Fork Black River, East Verde River, Silver Creek, Tonto Creek, and West Fork Little Colorado River) during the trout stocking seasons (April to September) of 2013–2016. From these interviews, biologists estimated total harvest (number of stocked trout kept by anglers), angler effort (total time spent fishing by anglers), and angler catch rates. Our biologists also implanted trout with radio transmitters, in order to track their movements and determine how long they survived in the streams. Check back tomorrow for No. 1. AZGFD’s Zach Beard, Ryan Mann and Andy Clark contributed to these posts. Do extreme amounts of stocked fish equal anglers catching bag limits? Well, stocking amounts are perhaps not as important as some have thought. For example, during the study, we varied the amount of trout stocked in a stream. Some streams received a big increase and some were cut in half. Our analysis showed the probability of catching a trout only increased by 3 percent (from 50 to 53) even when stocking numbers went up substantially. This takes into account all the other factors that go into catching a fish. Happy anglers is our goal. Our current stocking numbers seem to keep catch rates satisfactory. Increasing the number of trout stocked may not increase catch rates in these streams. Our hatcheries are at maximum capacity for producing fish (in 2013 we were 100,000 pounds short of the amounts of stocked fish our managers requested). And so studies like these are important in helping us spread stockings throughout the state in the most efficient ways possible. Fortunately, the majority of anglers were typically happy with memories made on our mountain streams. Factors such as an angler’s catch rate, age, and the tackle they used (bait, flies, or lures) influenced an angler’s satisfaction with their fishing experience. In general, anglers 50 years of age and older were less satisfied with their fishing experience at lower catch rates than younger anglers. Anglers who used multiple gears types on the same trip (bait, flies, and lures) were less satisfied with their fishing experience compared to anglers using a single tackle type. Check back tomorrow for No. 5.